As anyone reading my article on Eggs Benedict from earlier this year could tell, it’s one of my favorite breakfast dishes from the savory side of things. The combination of a good toasted muffin, some sort of proper meat product, a nicely poached egg, and a well-executed tangy hollandaise makes for quite the nice breakfast. It’s also very, very hard to find such a beast in the Upper Valley. Lou’s can poach a mean egg (their “poached eggs and hash” breakfast is one of my local favorites) biut only has a Benedict as an occasional special. Four Aces had one, but it was a rather poor specimen (limp sauce, and cold ham), and in any case Four Aces is no longer with us. I’ve had an outstanding one at Wasp’s in Woodstock, but that’s outside my normal range, and not open on Saturdays. Benedicts also grace a few other menus of area places (as the occasional special, mostly), but I’m generally left underwhelmed. In an area not particularly well-populated with a lot of breakfast joints, I’m generally forced to lived without. 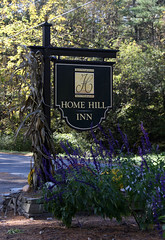 One place, however, has been advertising that they had the “Best Benedicts in the Upper Valley”: Home Hill Inn in Plainfield. Primarily a B+B, they also have a small pub and a dining room for both their guests and outside diners. So in mid-October we decided to drive to Plainfield and check it out. I’m rather glad we did, since I’ve been meaning to check out Home Hill for quite a few years, and the Benedict was indeed quite good. With several to pick from, I ended up opting for the Bacon Benedict. This was definitely a carefully made dish, with homemade English muffins, perfectly crisp North Country Smokehouse bacon, two nicely poached eggs, and a Hollandaise sauce that, while being on the creamy end of the spectrum, was definitely tangy enough to give the right overall flavor. Not the finest Benedict I’ve had (that still goes to Al’s in Minneapolis), but certainly on the top 10 list, and quite the well-executed dish. I dig this place, too. Went there about a year ago, and the chef has put a lot of thought into the menu. Ha, I always love your benny photos… 🙂 Seems like a really nice place.